In this edition of Writer’s World, Dan Gray interviews Angela Ewing, author of The Gunpowder Conspiracy, a mystery and historical romance, based on a true event in British history – the Gunpowder Plot of 1605. Angela tells how she became a writer and what inspired her to write this book when she discovered that few Americans have ever heard about the November 5th celebration in the U.K. every year. Angela has included a ghost or two in her book because she believes that spirits still linger on earth if they have unfinished business. 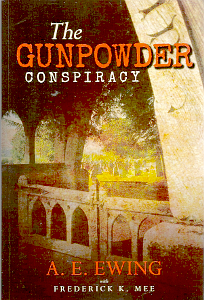 The Gunpowder Conspiracy by A.E. Ewing is available in book stores around Oregon. Jim Grandjean has been a writer for many years and has short stories on Kindle Fire. When I asked him about his inspiration for writing the “Golden Arm,” he answered. “I like baseball, underdogs, and the fact that you can’t judge a book by its cover.” He added, “Sometimes as in my story, life gets in the way and we have to change the landscape of our dreams.” That does sum it up succinctly. It is a story with a message for all of us. Not only is Lon Goddard well known in the music venues in Brookings, he was prominent in the publishing world of famous musicians in the U.K. many years ago. For me, as a writer and story teller, finding a voice to fit the genre of this poignant baseball story written by James Grandjean was very important. I chose Lon, because as an actor with the Pelican Players in Brookings, he immediately knew the personalities of the characters portrayed in the story. 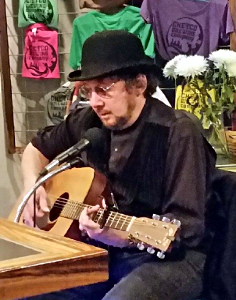 I hope you will enjoy “The Golden Arm,” Written by James Grandjean and read by Lon Goddard for KCIW, Curry Coast Community Radio. Story used with permission of the author, Jim Grandjean, read by Lon Goddard. Intro and end music: Golden Fields and Wheat Fields, licensed from audioblocks.com; Take Me Out to the Ballgame, performed by Kevin MacLeod, from incomptec.com, Creative Commons Attribution 3.0 Unported license. The Golder Arm used with permission of the author, Jim Grandjean. 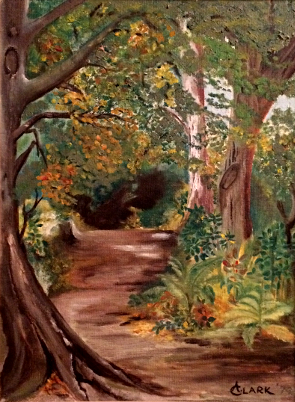 There was no doubt in my mind I saw her in the woods on that crisp autumn day in the woods. And if Annie, my Golden Retriever companion could speak, she would corroborate my story. Or was it just my imagination? You, the listener, can decide. Intro and end music: A Brighter Heart by Jason Shaw from from audionautix.com, Creative Common Attribution 3.0 Unported license.